Maya Moore initiates the drive past Sparks forward Nneka Ogwumike. Maria Noble/WomensHoopsWorld. 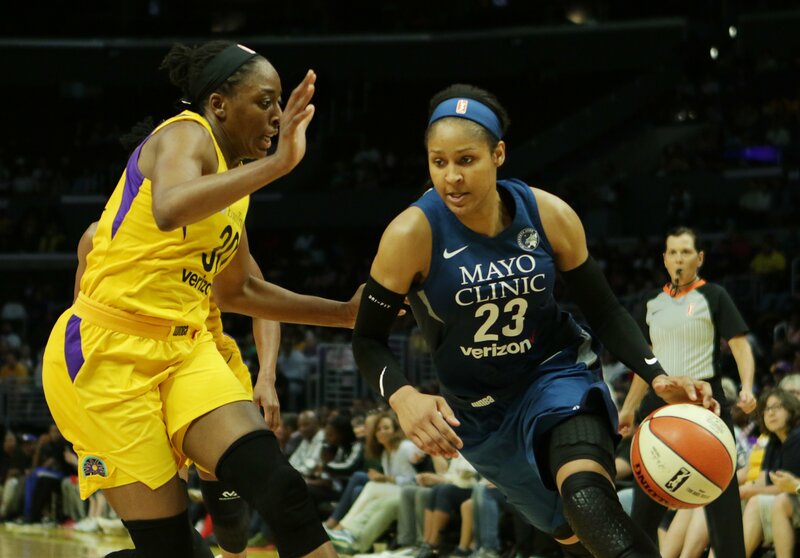 Four-time WNBA champion Maya Moore has announced she will step away from professional basketball in 2019. “My focus in 2019 will not be on professional basketball, but will instead be on the people in my family, as well as on investing my time in some ministry dreams that have been stirring in my heart for many years,” Moore wrote. Lynx coach Cheryl Reeve backed Moore’s decision in a statement. “We support her in this exploration and will continue to provide her the love and care she has always known from her Lynx family,” Reeve said. Moore helped Connecticut win two NCAA Championships and was drafted into the WNBA in 2011 by Minnesota, with the first pick. She has guided the franchise to four league titles. In mid-January the Lynx disclosed that they were “working with” Moore to determine her status for the 2019 WNBA season.